Some days ago a text with me speaking about the shoulder-in was published on Lusitano Portal and as the shoulder-in is one of the most fundamental and useful lateral movements I thought it would be good to share it here too. The uses of shoulder-in are almost endless, first of all its basic purpose is to supple the horse through the back, engage the hind legs and lift the poll. Shoulder-in is very good for helping the horse to find his balance in collection, it resolves stiffnesses, creates straightness and relaxation. It is an important and very useful exercises in the beginning of a horse’s education as it will help the young horse to gain muscles, find his balance and be supple through his body. At the same time it is very good for old horses as it will help keep them flexible. Shoulder-in will help you rebalance the horse if needed, help you prepare for other exercises, such as for example half pass or help to improve transitions. 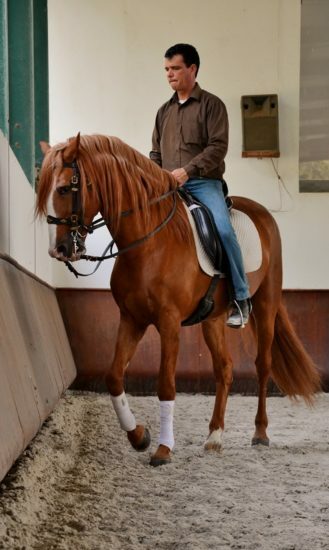 In a Shoulder-in, as in all other riding exercises, you are looking for that the horse is relaxed and finds his position, you need to be careful with the aids as strong aids will create tension. 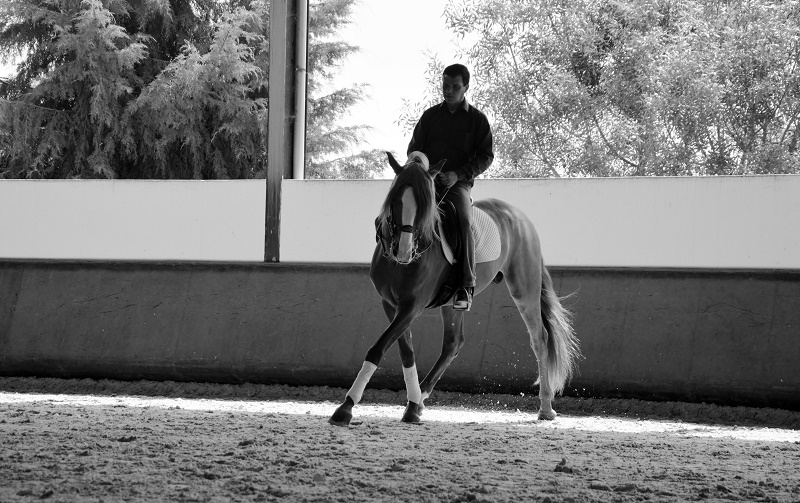 In the shoulder-in the horse should be bent for the inside leg but never crooked in the side. It is important that the bend is created through the seat and for the inside leg and not through the use of the hand. 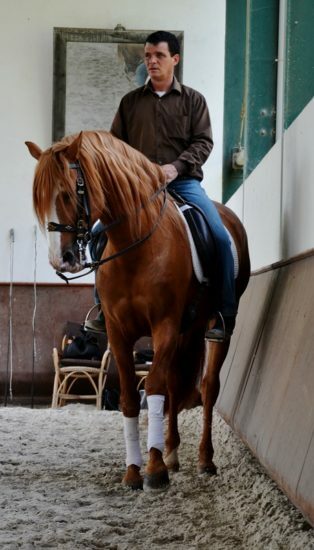 In the shoulder-in you need to sit as relaxed as possible with a straight back, keep the inside leg at the girth, the outside leg a little bit back to give support to the outside and twist your shoulders into the same position as the horse’s shoulders in the shoulder in. This will give you the right position but you also need to remember that there might be a need to shift your weight more to the inside or to the outside in order to help your horse with his balance, especially if he is young. What you are searching for is the feeling of the horse relaxing, starting to supple and find his position where he can work in balance with an even contact on both reins. Shoulder-in is possible to ride on both circles and straight lines, and it is beneficial to vary the way you ride the shoulder-in in accordance with your purposes. You can have the horse bent both to the inside and to the outside, especially for a young horse it can be beneficial to use the wall as support to help him find his balance. In the competition ring a shoulder-in is always ridden on three tracks, i.e. the inner hind leg of the horse follows the same track as the outside front leg. A common question is if it is wrong to ride a shoulder-in on four tracks and outside competitions the answer to this is no. When you are training you can adapt the “steepness” of the shoulder-in accordingly to your horse’s needs and what you want to achieve. For instance if your horse is very stiff there is no harm to ride a shoulder-in on four tracks, your horse will stretch more. If your purpose is to rebalance the horse or use the shoulder-in as a preparative aid for maybe a transition, you may keep the horse somewhere between two and three tracks. At the same time that this might be done placing the horse on four tracks, it is all dependent on situation. It is also the situation and your aims that determines if you ride a full longside or full circle in shoulder-in or just a few steps. The shoulder-in, like all other riding exercises, needs to be adapted to the needs of your horse in the very moment. Riding is something very subjective and if you have any questions or doubts I advise you to speak with your riding instructor that knows your horse and your riding. The photos are taken at Morgado Lusitano in Portugal.